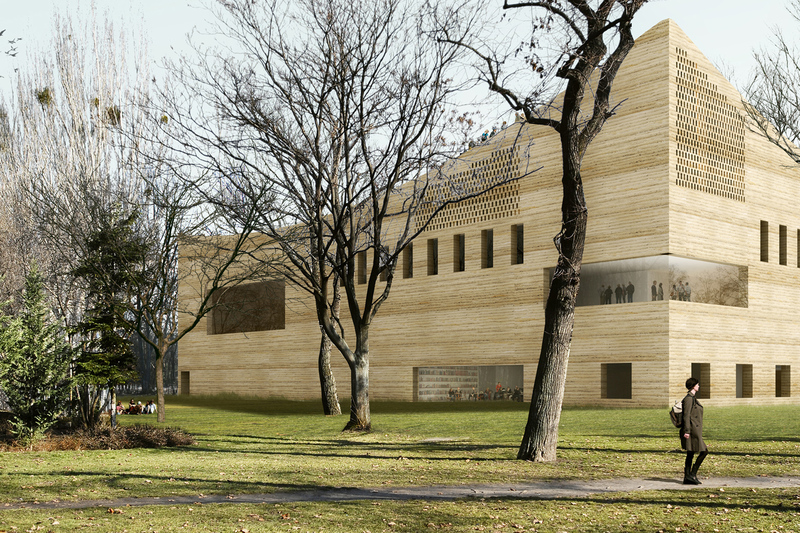 The new Museum of Hungarian Music will be a vibrant place. It will attract people from all over the world as well as from Hungary. When we think about a Museum of Music, we all have a bit outdated museum in mind. In there, you can only see things but not experience them. In our opinion, a Museum of Music should achieve much more than that. Why would there not be a Record Studio in the Museum? Why not being able to let people interact? We believe in buildings that can deal with transformations, buildings are not outdated when they need to be adapted to new conditions or functions. Moreover we believe in long-lasting architecture and in ideas that are rooted in the context and give the correct answer to client, citizens and to the context in which they are inserted. Location | The new Museum is located in a privileged area. It is located on the crossing road from all new museums and at the same time it is immersed in the park, in a quiet and green room. 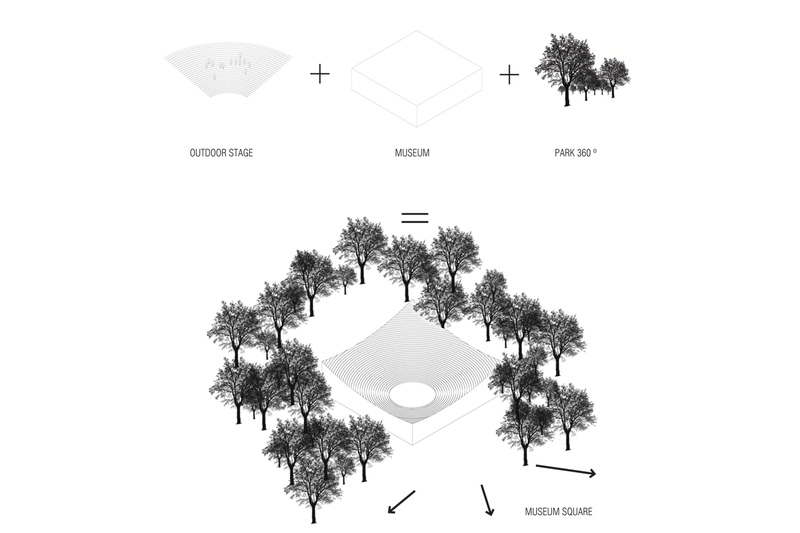 We are asked to design a museum and an outdoor stage in a relatively small plot full of trees. In order to diminish the amount of trees to be tear down, we decided to place the stage on top of the museum. The resulting shape, derived from its function, could work as an eye catcher and could awake curiosity among many visitors of the park. We propose a simple volume, a cube of 60x60m, with a very clear grid. The only alteration is the roof. 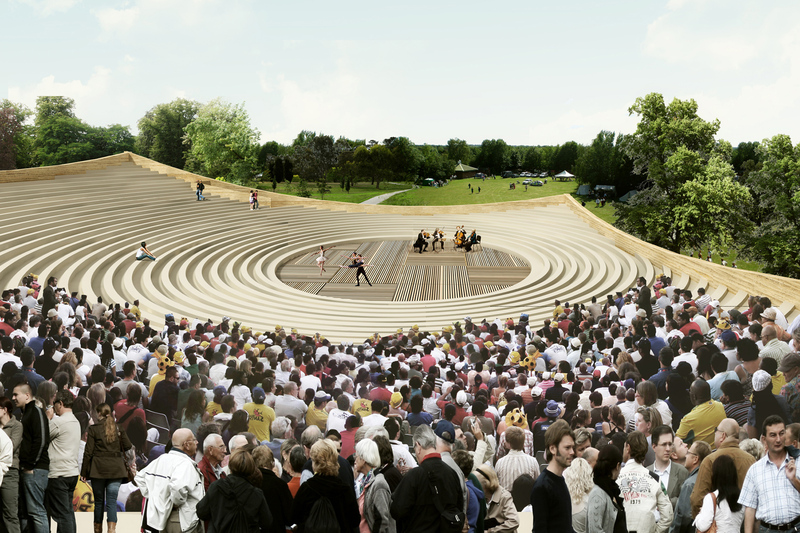 Its shape is based on a carefully studied amphitheatre shape. Our proposal is timeless, it does not follow any trend, it is just a container with beautiful proportions and easy to be reconfigured. Entrance | A big inner square marks the entrance. It is very high and bright. 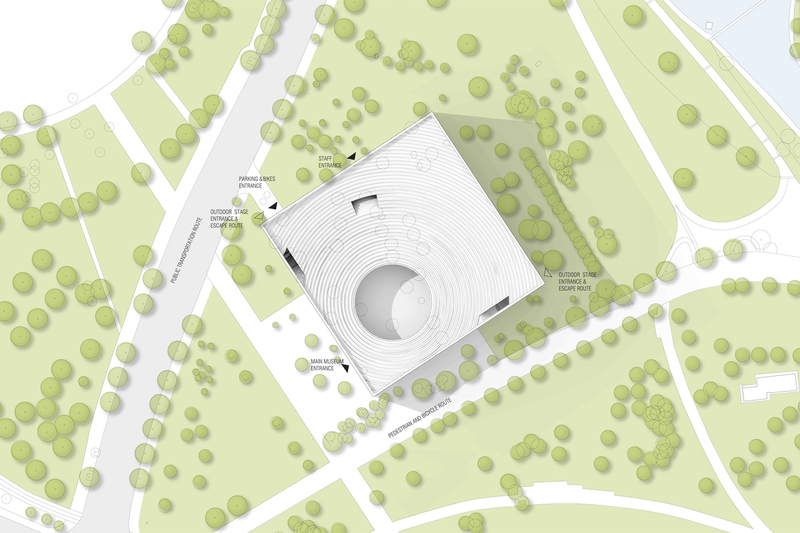 It works as a reference point for the visitors, a meeting place, a coffee corner and an information area. Even the Museum shop can colonise a piece of this common area. The main hall is always accessible and the access is free. Exhibition halls | The exhibition area is organised in a way that two different exhibitions can take place at the same time without interfering with each other. If needed the area can be transformed to one unique space. The exhibition rooms are all very similar in shape, but very easy to transform. As the layout is based on a regular grid of 12x12m, it is possible to organise different circulations and set ups. 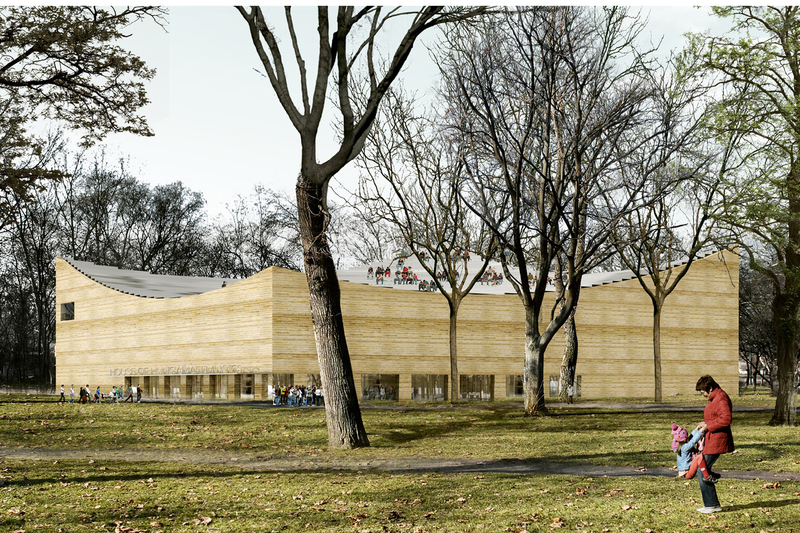 Material and construction | We propose to build the New Museum with rammed earth construction. 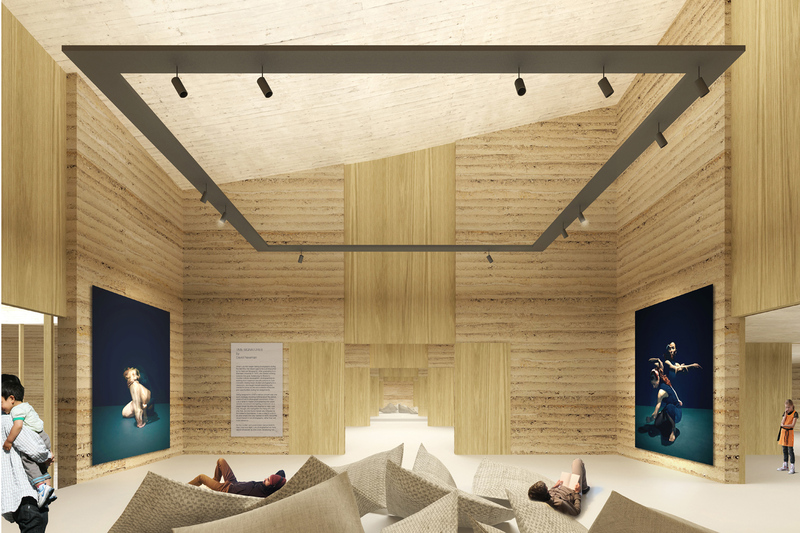 Rammed earth can effectively control humidity where unclad walls containing clay are exposed to an internal space. Humidity is held between 40% and 60%, the ideal range for asthma sufferers and for the storage of such susceptible items as books. The material mass and clay content of rammed earth allows the building to ‘breathe’ more than concrete structures do. Due to this we are avoiding condensation issues without significant heat loss. Rammed earth is a popular choice for buildings where temperature fluctuations need to be kept to a minimum, such as a Museum. Furthermore internal walls of rammed earth are extremely useful in providing sound insulation between areas with different needs. Program: Exhibition space, learning centre, restaurant, auditorium, lecture room, library, outdoor stage, parking and storage spaces. Status: Competition. Based on the jury evaluation, our proposal was amongst the best 15 entries from the 473 proposals. Honourable mention: Sustainability.